Keep your Aspects Big Tube Bird Feeder protected from rain, snow, and squirrels with the Aspects Super Tube Top II. This dome is designed to slip over the hanging wire of your existing, Aspects Big Tube Bird Feeder (not included), and rests nicely atop the lid with no hardware. Its 18" diameter is perfect for protection against the elements, and is also large enough to deter squirrels. 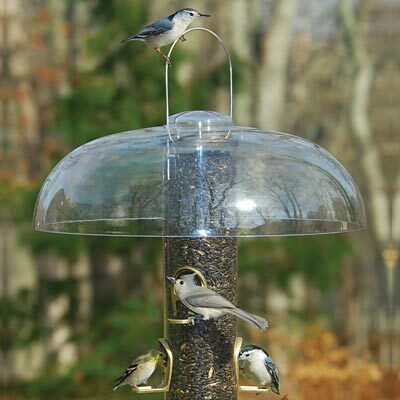 The clear plastic keeps your feeder visible and will last for several seasons. Easily protect your Big Tube Bird Feeders with this Super Tube Top II. Made in the USA. Lifetime guarantee. Note: This description refers only to the Aspects Super Tube Top II Dome. The feeder shown is not included and must be purchased separately.